A guest post by LH Member Brian Cookson. This article was first published in LH Members’ Newsletter of August 2014. By the early nineteenth century, with the increase in population in west London and improvements in transport from the centre, people who wanted to cross the river from Hammersmith to the Surrey side by road had to make a five mile detour either via Kew or Putney Bridge. After the usual abortive attempts to construct a river crossing, a group of local people formed the Hammersmith Bridge Company and raised £80,000 with a view to presenting a Bill before Parliament. Despite strong opposition from the proprietors of Kew and Putney Bridges, the Act enabling the building of Hammersmith Bridge, which was to be the first suspension bridge over the River Thames, finally received Royal Assent on 9 June 1824. The engineer chosen to design Hammersmith Bridge was William Tierney Clark who was the engineer of the nearby West Middlesex waterworks. Clark’s proposed design of a suspension bridge at Hammersmith was attractive as it required the construction of only two river piers and provided a 400 ft. wide navigation path for shipping. Tierney Clark’s magnum opus was undoubtedly the famous chain bridge over the Danube at Budapest. The bridge was completed in 1849 and survived until its destruction by the retreating German army in 1945 at the end of the Second World War. After the end of the war the bridge was rebuilt according to Tierney Clark’s original design and stands today as a foreign monument to the great engineer. The choice of a suspension bridge was a daring decision to take, since no successful large-scale suspension bridge had ever been built except for the pioneering Union Bridge over the River Tweed near Berwick, constructed in 1820 by Captain Samuel Brown (1776-1852). Brown supplied the ironwork for Hammersmith Bridge, but it was Tierney Clark who designed it with two massive stone river towers which supported the suspension chains and formed a Tuscan archway through which the road platform ran. Since Thomas Telford (1757-1834) was in the process of constructing a similar suspension bridge over the Menai Straits between Wales and Anglesey at this time, Clark submitted his plan for Telford’s comments. There was considerable mutual respect as well as rivalry between the great engineers of the nineteenth century and so it was not surprising when they asked each other’s advice. Telford’s Menai Bridge was completed in 1826, one year earlier than Hammersmith Bridge. The Menai Bridge has a central span between the supporting towers of 579 ft. However, the road between the towers and the shore is supported on masonry arches. At Hammersmith the central span between the river towers is 400 ft, but the suspension chains also support the road platforms between the river towers and the river bank. This gives a total length of 688 ft. and allows the claim that Clark’s Hammersmith Bridge was the longest suspension bridge in the world at the time it was built. Tierney Clark’s Hammersmith Bridge of 1827. From a practical point of view, the bridge had significant shortcomings. The width of the carriageway was 20 ft. and there were two footpaths of 5 ft. on either side. This was not unreasonable for the traffic conditions at the time, except that where the road went under the thick stone arches its width was reduced to only 14 ft. and at this point it had to provide for both vehicles and pedestrians. Traffic was about to increase substantially not least because of the existence of the bridge itself. It could even be said that the bridge put Hammersmith on the map rather than vice versa. With the creation of the Metropolitan Water Board in 1855, pressure grew to free all the bridges in its area of toll charges, especially since the upstream bridges from Kew to Staines had already been freed . In 1877 the Metropolis Toll Bridges Act was passed to allow for the MBW to purchase the bridges and abolish the tolls. Hammersmith, Putney and Wandsworth Bridges were all declared toll free on the same day, 26 June 1880. Sir Joseph Bazalgette, the chief engineer of the MBW which now owned the bridge, was concerned about its safety. He produced a report recommending the complete reconstruction of the bridge superstructure on top of the existing pier foundations, and in 1883 an enabling Act was passed. The new Hammersmith Bridge, like the old, was designed on the suspension principle but has a much more fanciful appearance than its predecessor. Structurally there are major differences in the use of material. The suspension chains are of steel rather than wrought iron. The river towers, instead of being built of stone, have frames of wrought iron which are clad in ornamental cast iron. Since iron is lighter than the equivalent strength masonry, the towers take up less space and allow a wider opening for river traffic through the arches. As a result, the carriageway under the arches is now 21 ft. wide, instead of 14 ft., and there is room for two 6 ft. footways which are cantilevered and curl round the outside of the towers rather than sharing the carriageway with the road as with the old bridge. On the river banks, instead of the toll gates which had been located there when the old bridge was built, Bazalgette constructed highly decorative abutments which take the suspension chains underground to a depth of 40 ft. where they are firmly anchored. The current bridge, by Sir Joseph Bazalgette. Unfortunately, the bridge has suffered from problems of wear and tear, and has had to be closed a number of times. Natural deterioration has not been the only danger to which Hammersmith Bridge has been exposed . The IRA has tried to blow it up on no less than three occasions, but with limited success. Not everyone has agreed with the aesthetic merits of this bridge. William Morris, who owned a riverside house in Hammersmith, called it simply ‘this ugly suspension bridge’. However today it stands as a monument to Victorian engineering and design, beloved by the public, and seen by millions as the Oxford and Cambridge boat race crews strain for victory as they pass underneath every year. Brian Cookson is the author of Crossing the River: The History of London’s Thames River Bridges from Richmond to the Tower and London’s Waterside Walks. He is also a Blue Badge Guide who offers various fascinating guided walks of London. Find out more on his web page: www.lonwalk.ndirect.co.uk/. The most famous of London’s many bridges celebrates its 120th birthday this year. Horace Jones’s masterwork was opened by the Prince of Wales on 30 June 1894, nine years after the Act of Parliament was passed to bring it into being. 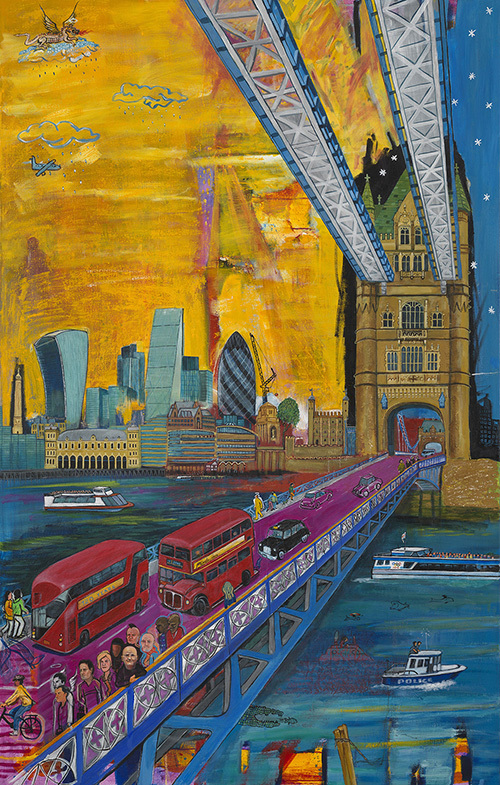 To mark the occasion, the Guildhall Art Gallery has just launched an exhibition of representations of Tower Bridge down the years. Like Sir Charles Barry and others before him, Jones didn’t live to see the completion of his most prestigious project. He is remembered here at the entrance to the show with his most famous portrait along with that of his engineer, John Wolf Barry, son of Sir Charles himself. 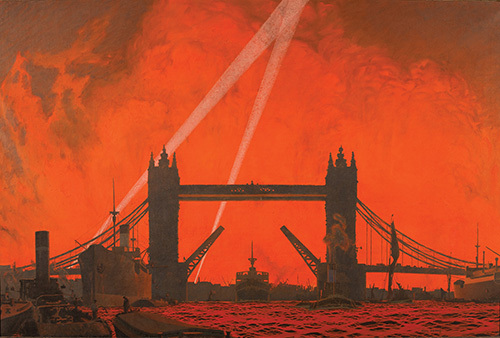 Charles Pears (1873-1958), Blitz. Our London Docks, 1940, oil on canvas. Guildhall Art Gallery, City of London. After this, the bridge itself is the only star. There are many dozens of depictions spanning over a century. They include water colours, oils, pencil drawings, and photographs. Most notable of the latter are an amazing survival from the early 1890s of the bridge being built and we are reminded that for all appearances, this is a steel bridge with cladding. There are also fine engineering plans of the towers, along with ephemera relating Tower Bridge’s earliest days: invitations and programmes for the opening and even for the laying of the foundation stone. Incredibly elaborate items where Union flags abound. This was, after all, to be the new front door of the capital of the world’s greatest power at its mightiest. But by far the biggest element of the show are the paintings. They are in a multitude of media, taken from every viewpoint: the pool of London; Wapping; Rotherhithe; and at least one from the bridge itself. The London skyline, an evocative addition to any landscape features varyingly. But there is another star of the show: it is, of course, the Thames. And with the Thames come boats and boatmen. All subject matter that is a gift to the painter: if you think about it, nothing possibly can go wrong for any artist. There was only one picture I thought was not particularly good, but even it looked delightful thanks to a quite nice tugboat centre stage: it was very much the exception. So an exhibition featuring images of the most photogenic (and yes, there are old photos too) bridge in the world is hardly going to struggle. But they still have to be sourced, chosen and displayed in a coherent way, and variety here is key. Moody here, frivolous there; the highly detailed rubs shoulders with the broad brush approach. The arranging is broadly chronological without being slavishly so. The gallery and curator have got this all completely right and the result is delightful. You’d be mad not to go: entrance is free. 120 Years of Tower Bridge (1894-2014) runs from 31 May – 30 June, so not particularly long. 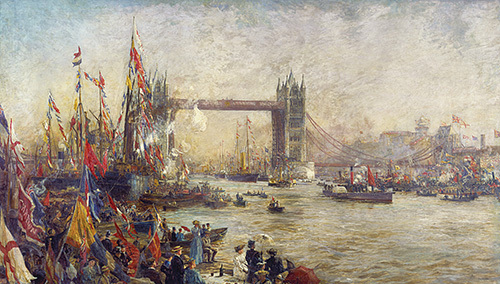 William Lionel Wyllie (1851-1931), The Opening Ceremony of the Tower Bridge, 1894-5, oil on canvas. Guildhall Art Gallery, City of London. 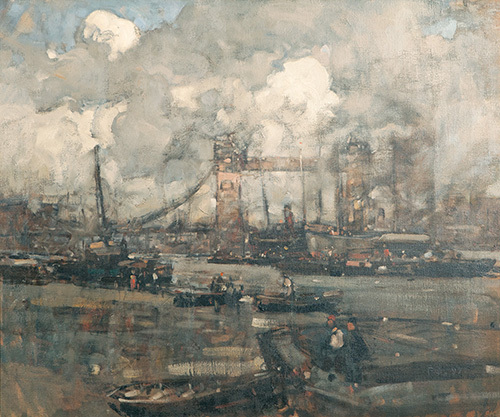 Frank William Brangwyn ARA (1867ÔÇô1956), The Tower Bridge, about 1905, oil on canvas. James Page-Roberts (b. 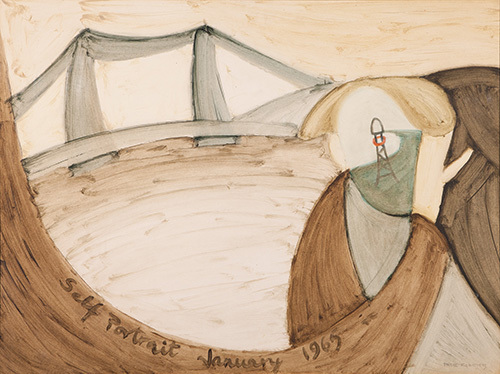 1925), Self-Portrait with Tower Bridge, 1965, oil on canvas. Copyright The Artist. Judith Evans and Arthur Watson (b. 1949, b. 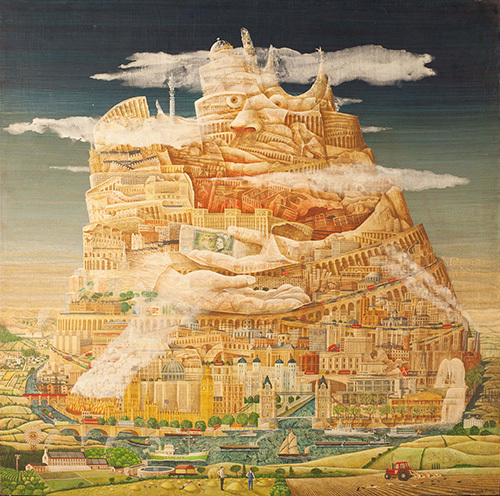 1946), The Spirit of London, 1981, oil on canvas.